In a heated grudge match of former world champions from Puerto Rico, Juan Manuel 'Juanma' Lopez (35-5, 32KOs) stopped Wilfredo 'Papito' Vazquez Jr. (24-7-1, 19KOs) in the eleventh round, after which a post-fight brawl erupted. The crowd seemed to be split down the middle at the Coliseo Roberto Clemente in San Juan. Juanma was trying to close the distance in the fourth as Vazquez was trash-talking. The two boxers started swinging punches at each other as the referee tried to break them - leading to a firm warning from the ref to both boxers. Juanma was forcing his punches and they were either missing or not doing much damage. Vazquez got rocked in the fifth from a right hand. He was able to hold Juanma and stayed away to get himself out of trouble. Juanma continued to rally a bit in the sixth, landing more punches and snapping back the head of Vazquez. Vazquez seemed to buzz Juanma during the seventh and was putting his punches together much better as he was going for a stoppage. Juanma was firing back, but getting tagged by the quicker Vazquez. They were exchanging punches at the start of the eight. Juanma appeared to have the edge with Vazquez appearing to have an issue with his right eye. Juanma was pushing the pace in the ninth, coming forward and throwing punches. Vazquez was slowing down and not doing much work during the three minutes - until the final ten seconds when they traded some punches. The tenth saw Juanma step off the gas a little bit, but he was more accurate with his punches as Vazquez has little offense in return. 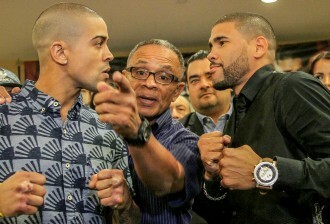 Boxing Scene noted “there were still issues with Vazquez's eye as Juanma was taking the fight to him in the eleventh. Juanma blasted him with a left, Vazquez was rocked and then Juanma started drilling him with punches against the ropes as the referee jumped in to wave off the contest. Vazquez's corner was incensed with the stoppage and a brawl broke out between Juanma and Vazquez's cornermen, as the camps began throwing punches in the ring and the crowd was pelting items in the sky before order was restored.